For those people who do not have an aversion to eating pork for religious or other reasons, this has become a good alternative protein meat source. It is generally much lower in fat than most beef because of modern ways in which the pigs are raised. It is commonly referred to as "the other white meat" referring of course to chicken. We enjoy eating pork in many different ways and my husband who is very creative in the kitchen...especially when testing new recipes with one of his favorite wines...recently came up with this scrumptious recipe. My hubby and his business partner broker wines and many of them come from Italy. Often times he likes to see which foods pair best with them by experimenting in the kitchen. I'm a lucky gal since I am naturally part of his tasting panel. Sometimes we have a friend or two join us so that they can also weigh in on the results. This recipe for pork ribs got its name because of the wine that became a part of the recipe. Naturally other rich tasting Chianti type wines could be substituted. Thus without further ado here is the delicious Pork Garda Rosso recipe for your enjoyment. 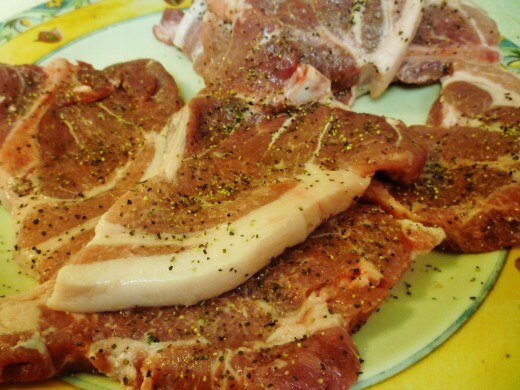 Wash and pat dry the bone-in pork and cut into serving sized pieces. Cooking this with the bones left on is optional. 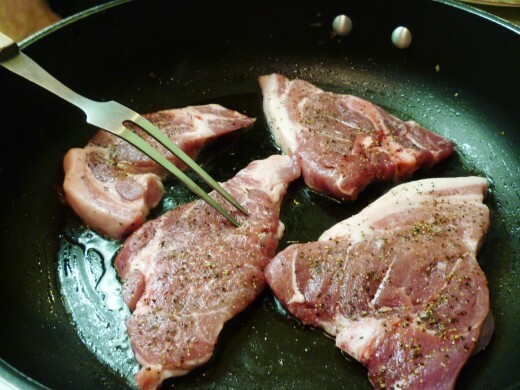 Salt and pepper both sides of the pork to taste. 3. 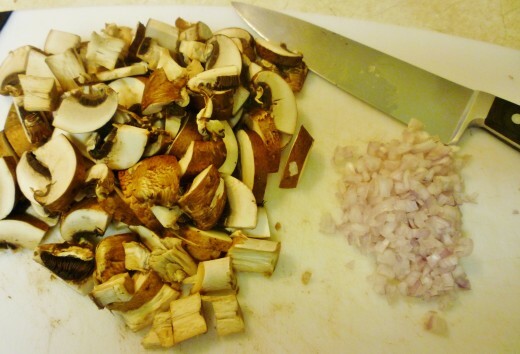 Finely chop the shallot and slice the mushrooms. 4. 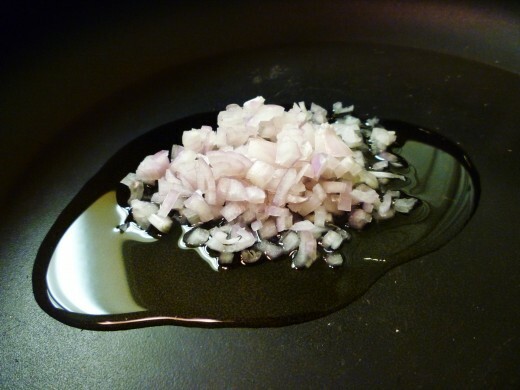 Saute the shallot for about a minute in a non stick pan in oil over medium high heat and then add the mushrooms removing them to a dish when wilted. 5. In the same pan after adding the butter, saute both sides of the pork until nicely browned and remove from the skillet to another dish. 6. 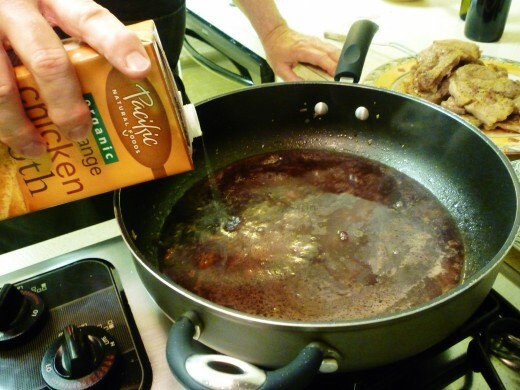 Deglaze the pan with 1/2 cup of the red wine scraping up the browned bits of fond from the bottom of the pan. 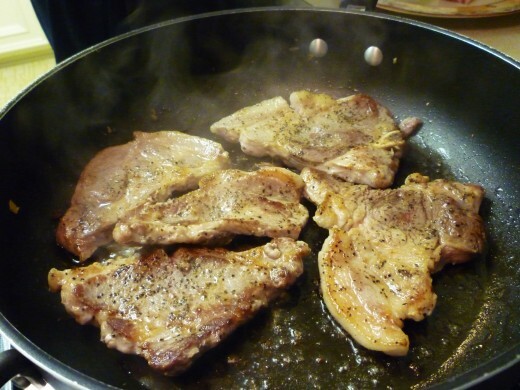 Reduce the juices until they have just about disappeared from the pan. 7. 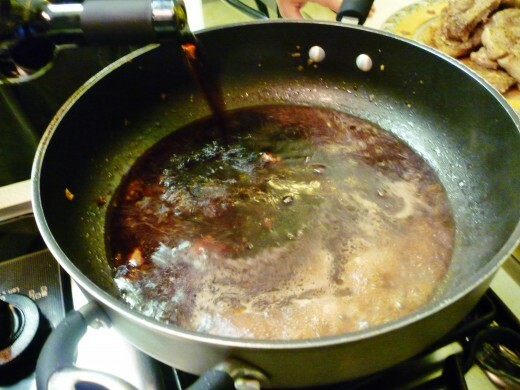 Add another 1/2 cup of the wine and a 1/2 cup of the chicken broth and again reduce over high heat, stirring frequently until the pan juices are reduced by at least two thirds. What this is doing is concentrating the flavors of the eventual entree that you will be serving. 8. 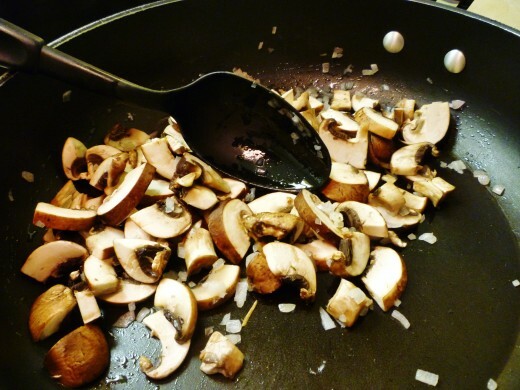 At this point add the meat and any meat juices that have accumulated on the plate, and the shallot and mushroom mixture back into the pan. 9. Top this off with the balance of the wine and chicken broth...another 1/2 cup of each. 10. Cover and bring to a boil. Reduce the heat to a simmer and braise until done and fork tender...approximately 1 hour. 11. Check occasionally to make sure that there are still some juices in the pan, adding a bit more only if needed. 12. Serve with your choice of side dishes and enjoy! Most chefs advise that when cooking with wine one should utilize one that is also enjoyable to drink from a glass....perhaps even use the same one with which one is cooking. We did that with the Italian Garda Rosso wine and the pairing was perfection. Naturally if one is uncorking a rare or very expensive wine one might wish to use a less pricey one with which to cook. Just try to keep it in the same flavor profile as to grape or varietal. 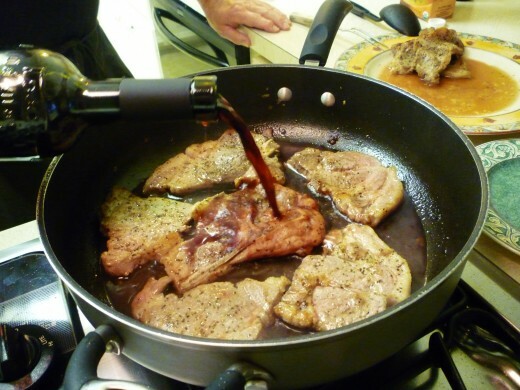 Cooking with wine can help tenderize a meat and also cut down on the amount of fat one uses in preparation. 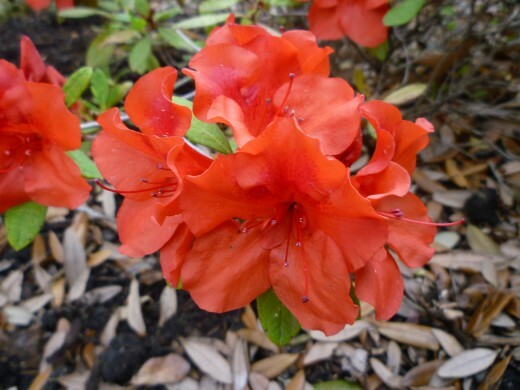 Most of all in addition to adding needed moisture it imparts a distinctive flavor to the meal. If you ever find yourself with extra wine in the bottle that has become vinegary in its taste or past its prime, think of letting it go all the way and actually become a wine vinegar. It can be used in salads and other manners. After the prep time and once everything is in the covered pan simmering away and developing those succulent flavors, you can concern yourself with the rest of the meal. It can all be done stove top if you like while occasionally checking on the pork ribs to make sure that some juices remain in the pan. If you need to top it off with a bit more wine or chicken broth that is okay. If you are like some of the television chefs, you might even wish to have a glass of the wine while you are cooking. No wonder they all seem so happy! If using leaner cuts of pork like tenderloin in order to cut down on a few calories the end result may not be quite as fork tender but the flavors of the sauce will be the same. Once in a while it is okay to indulge in a fattier cut of meat. As many chefs say..."Fat equals flavor." Everything in moderation is the goal. Pork Garda Rosso served with Creamy Risotto & Peas with diced Red Pepper. Did you like this article? If so please give it a star rating. Thank you! Hope you enjoyed your pork meal tonight. We watched the debate tonight as we do all the others. Fireworks tonight between the 3 on center stage. Certainly an interesting political season and unlike most others due to the candidates running for President. Oh my! is right! I agree that often dishes cooked with the same type of wine one wishes to drink turn out well assuming the wine is good to start with. In this case it was definitely a winner. Yes this would make for a delicious valentine's dinner. Thanks for the share. Hope you are enjoying your weekend. 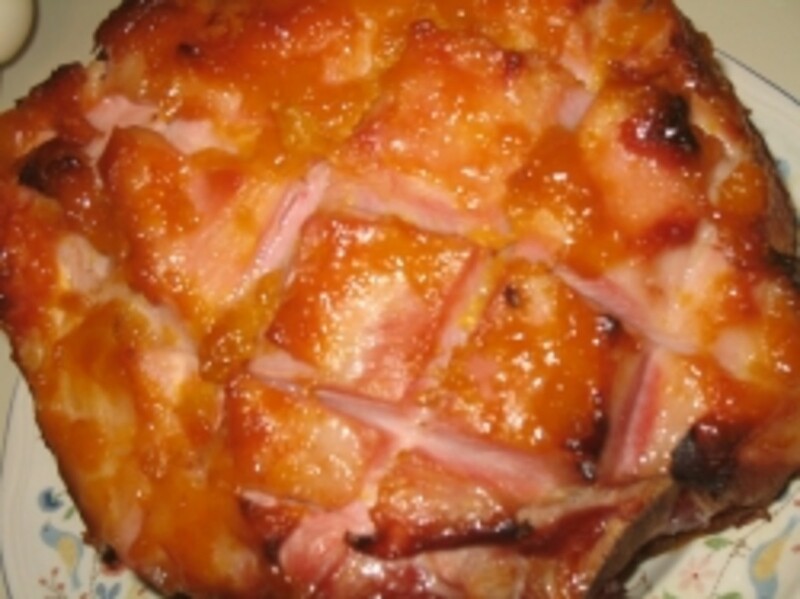 Happy to know that you like this recipe. Sending angels your way also. This looks like a dish I would really like, Peggy. And I enjoy the flavor of wine paired with dishes cooked in same. Thanks! Back to share this excellent recipe again. It's almost Valentine's Day, and this would be a superb dinner to make for someone special. Hope you've had the same great weather down there as we're having up here the last few days. Ours is about to end, but after a few days of cold it's supposed to come back. Hope all is well with you Peggy. Take care . . .
Yum...every time I see this my mouth waters...and it is a dish I feel I can eat without feeling guilty. I am so lucky that my hubby loves to cook and we often enjoy good meals together such as the one featured here. Glad you liked it and thanks for the share. But this certainly looks like something I would love. I won't mind cooking at all!...Thanks. Getting to be that time of year when staying in and enjoying a lovely homemade meal will make for a perfect evening. Came back to share this wonderful meal and recipes with my followers. I know that you are heading into the colder weather where you live so a warm tasty meal like this would probably be perfect. Enjoy! 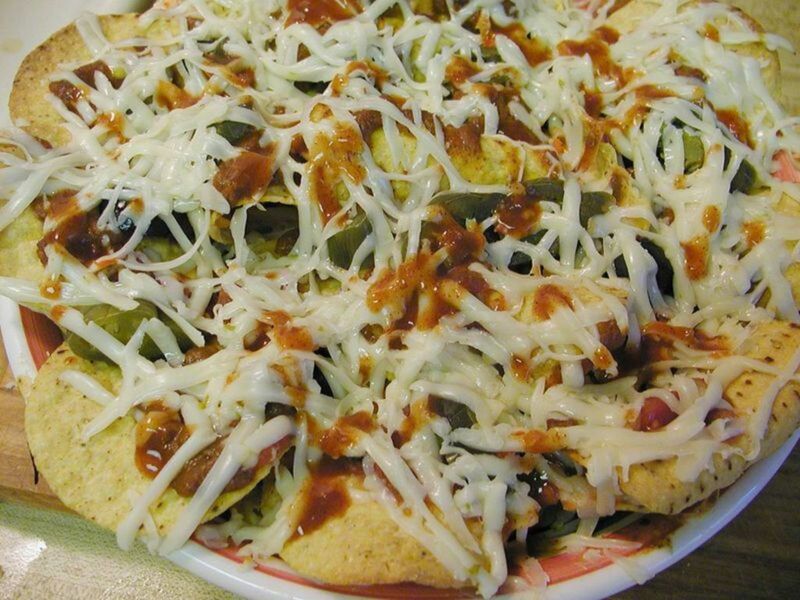 My hubby likes to make this recipe and yes...it is yummy! Sorry if it made you hungry looking at the photos. :) Thanks for the votes, pin and the share. I have not had dinner, Peggy. Cereal is on tap for tonight. But I have to give this a try. If I read this before I did not pin it so I am pinning it now.YUM. Mouth watering.. It is delicious. Hope you give it a try! Merry Christmas and Happy Holidays! This seems like a really delicious recipe. Thanks. It is delicious. Hope you enjoy it! This is a delicious recipe. Hope that you give it a try. Thanks for your comment, votes and shares. Appreciate it! A very interesting pork recipe, Peggy. I've never tried one with wine and chicken broth. It is so different to the way we make them here. Looks absolutely delightful. I like the great gardening tip for using the vinegary wine as well. Voted up and interesting. Shared on facebook and pinned too! They always advertise pork in the USA as "the other white meat." If they get people to eat more pork, obviously it is a successful advertising campaign. :)) Glad to know that you liked this hub. Appreciate the votes and the 5 star rating. Thanks! Peggy I really love your hubs, you put great pictures be it recipe or travel. I really liked the way you described other white meat. I always thought pork as red meat. Voting it up, useful, interesting and 5 stars. Believe me...this tastes even better than what my photography of it portrays. Enjoy this recipe! Thanks for the comment. It is really good! Hope that you will give it a try. Appreciate your comment, vote and especially the share. This sounds and looks very good. Voted up and shared. Perhaps someday you will have the time to make this pork rib recipe with the red wine, mushrooms and shallot. It is really good! Appreciate your 5 stars, votes and the sharing of this with others. Thanks! Just got home from work and this looks so yummy! I'm hungry!! Wish someone had my supper ready for me . 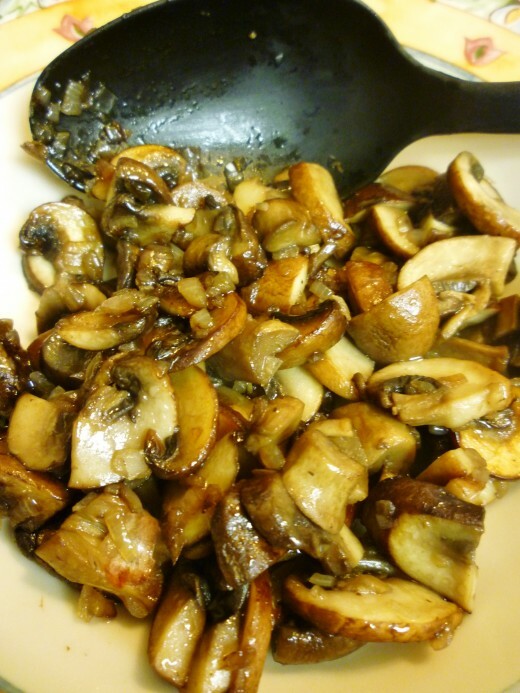 . . ;) Seriously, this looks delicious and I love mushrooms and shallots. Good plant tips too! Voted up, useful, gave you 5 stars, and will share. How fun to not only be in Italy but to have taken a cooking class there! Sounds like a dream come true. Let me know what you think of this recipe when you give it a try. We think that it is delicious! Thanks for your comment. This looks delicious. 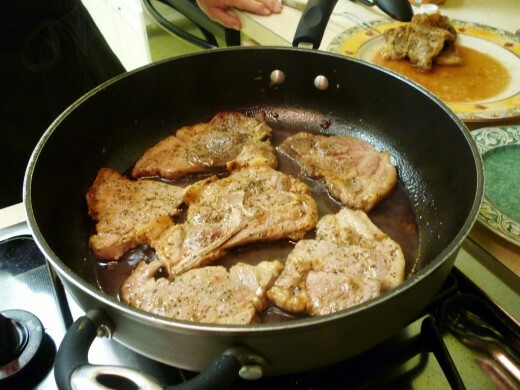 When I was in Italy, I took a cooking class and one of the dishes we made was pork cooked in wine. But a very different recipe. I'll have to try this one, too. 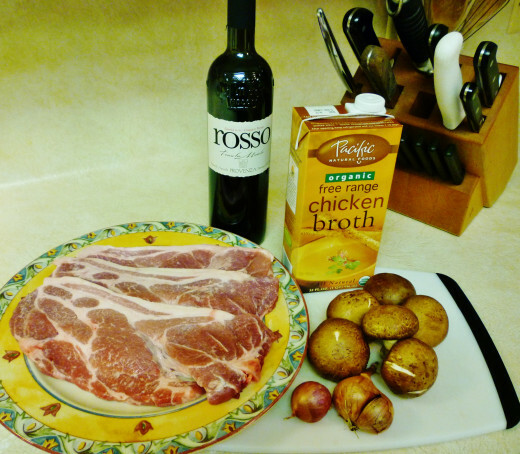 So glad to read that you enjoyed learning about this pork recipe with the red wine and Crimini mushrooms. Hope you give it a try and enjoy it as much as we do. Thanks for your comment, vote up and especially the share. Your dish make my mouth water. You have made it look so easy to make. Step by step instruction to make it. Quality dish. Voting it up and sharing. We are in full agreement on that! Good wines make a dining experience even better! 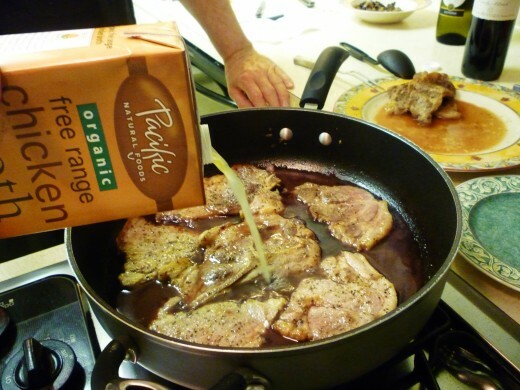 Thanks for your comment and share regarding this recipe utilizing red wine as an ingredient. This looks absolutely delicious, and I am sharing. Good meats must be paired with good wines....makes the dining experience and even greater one! Thanks for sharing! Happy to be able to share this pork rib recipe with you. Appreciate your comment and vote. Hi Peggy, spare rib pork is one of my favourite cuts - your recipe and photos are mouth wateringly good! I am so looking forward to trying this, thank you and voted up! I understand! That is what the HP contests do...in this case the focus was on recipes. Nice to read other subjects. I'll have to get back to writing other things again. I skipped the plumbing contest. Ha! Thanks for your comment on this pork rib recipe. I have to apologize; I got so tired of reading recipes last month that I eventually just quit reading them....so I haven't been by your site lately. Now that I've had ten days without a recipe I'm going back to some of the people I follow and reading....so here I am....and I love this recipe. Anything with pork or beef I will sign up for, and this sounds delicious. Great job Peggy! 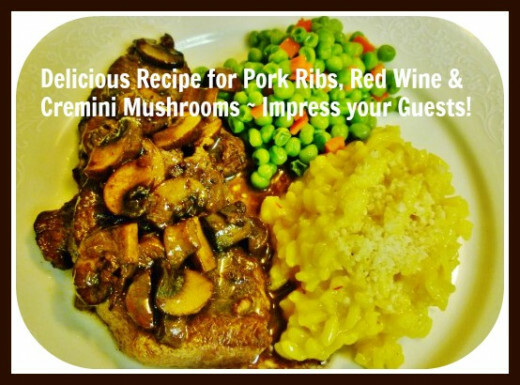 Nice to have the comment from you on this pork rib recipe with red wine and cremini mushrooms. Hope that you make it and enjoy it. Thanks. 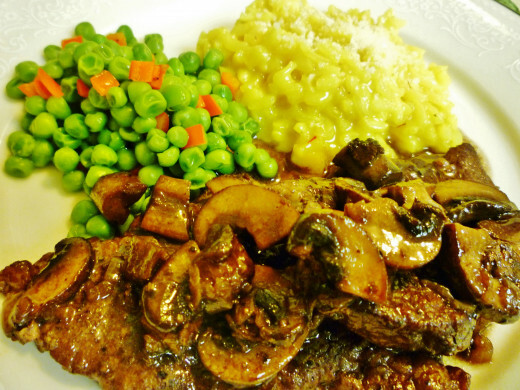 The wine and mushrooms do make for terrific flavors in this pork entree. Appreciate your comment and votes. Thanks! This is quite exotic and looks delicious. I love the use of the wine and the mushrooms. Voting this Up and Useful. 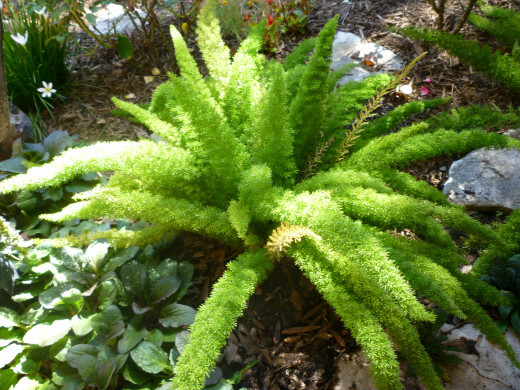 I have never been informed by any gardening article or nursery expert to pour diluted wine on acid loving plants. It just made sense to me since it does have some nutrients and seemed a shame to pour down the drain. All I can say is that the "proof is in the pudding"...the plants seem to like it. Ha! Thanks for your comment. Scrumptious recipe indeed! The plant does look happy, who knew that old wine would help? 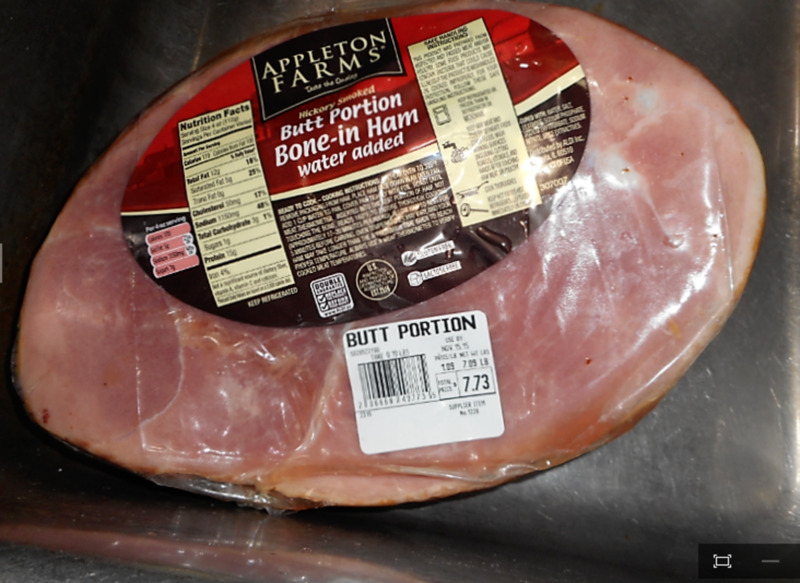 Perhaps one of these days Bruce will be cooking this pork rib dinner when we have you over for dinner. Glad that you liked the videos and tip about using wine on your plants. Fortunately not too much of the latter is needed...only occasionally. :) Appreciate your comment and votes. 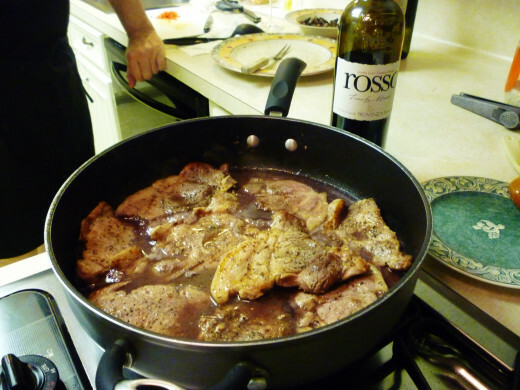 So glad to know that you are interested in trying this pork rib recipe with the red wine and cremini mushrooms. Enjoy! Thanks for your comment. What a beautiful meal. I know it is the best. The recipe sounds easy enough for me to prepare. Perhaps during the holiday. 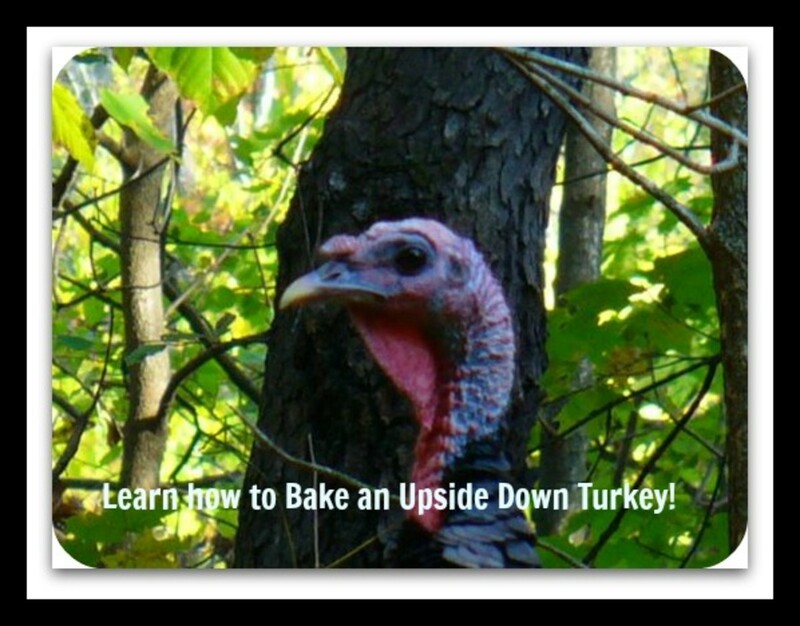 Thanks for the detailed instructions, photos and videos on cooking with wine and making wine vinegar. Great tip for the plants. Awesome and useful hub. This is a wonderful looking meal and I am interested in that recipe for sure. Thanks. Admittedly there are some perks to the type of job my husband now has. He has always been interested in wine from when I first met him and at one point we were part owners of a vineyard in California. While that investment did not exactly pan out as we would have liked, the allure of wine continues. Thanks for your comment, votes and the sharing of this hub with others. Glad that you liked the photos. I was busy taking pictures as my husband was cooking. We make a good team! Easier than when I am cooking and have to stop at various intervals to take the photos. Thanks for your comment. I'd like to be a part of your taste panel! My roses would be happy if I gave them some wine, too. Back in the day when I enjoyed my wine, I would start drinking as I cooked the meal. By the time I was ready to serve the dinner, I was sauced! You always make your food look so good, I can smell it cooking right now! I gave you all the stars I could. I voted it UP, and wish there was a choice of mouth "watering good". I will share this here, and on FB. Glad that you liked the ideas of cooking with wine with regard to this recipe and perhaps others as well. It can definitely perk up an ordinary dish and make it delicious. Appreciate your comment and the sharing. If you could smell the aromas when this pork rib entree is being cooked, you would be even more hungry! :) Thanks for your comment, votes and the sharing. Ahh...we can always use more people on our testing panel. 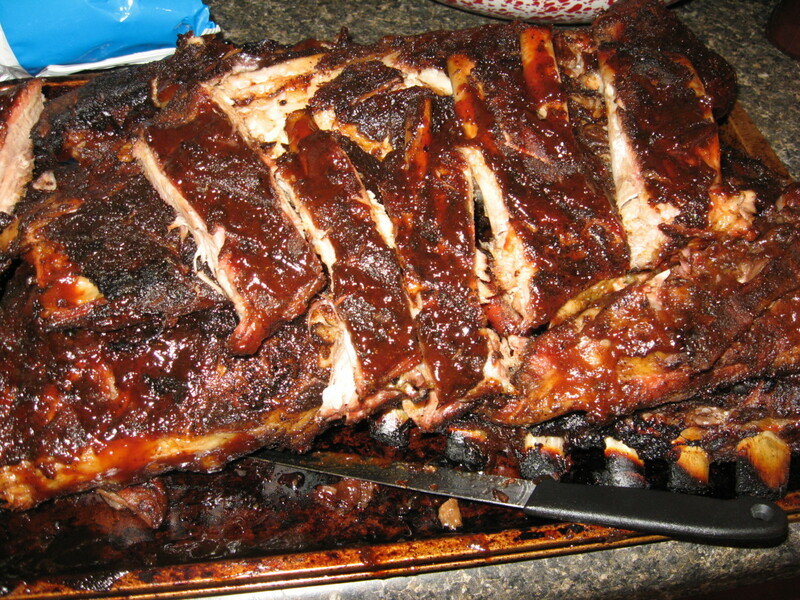 :)) Perhaps you will decide to make these pork ribs for yourself one of these days? Thanks for your comment and votes. Your photos make my mouth water! How awesome to have a husband whose job puts you in contact with Italian wines. Thanks for all the extra tips, even about gardening. : ) Voted up and shared. Your recipe looks tasty and your pictures are awesome. I've only just eaten lunch and yet you have managed to make me hungry again. This looks and sounds amazing, you are very lucky to be the tester! Sharing, up, awesome, and tweeted.